And they learnt some English on the way! The participants didn't have to bring the British flag back from the Crewe & Nantwich Twinning Association Summer School. It was on hand on the flagstaff in front of the Council Chamber. What they had brought back was an understanding of the new British way of 'chillaxing'. It's known in many Bischofsheim families as getting around to things sometime. This year, for the third time men and women from Bischofsheim stirred themselves to raise the level of their understanding of English in Crewe & Nantwich. But, as always in the 'Summer School', the lessons were only a part of the experiences they had during a week spent in western England. Naturally the 11 strong group had much to explain to the mayor Ulricke Steinbach and the local press concerning the many interesting things the teacher had successfully taught in the morning sessions. The Summer School is obviously going to be used wisely by both sides to bolster the relationship between the two communities. And with this idea CANTA threw itself into the task. Anyhow, the Bischofsheimers sat, with six French guests and the teacher, in a room for three hours . Also the teacher, in those three hour morning sessions, had to come up with a skillful teaching/learning strategy catering successfully for the differing levels of experience. That succeeded brilliantly in the opinion of the German participants. And now it's books excitedly put away as the partner towns and Cheshire had a lot to offer. In the evenings barbecues and country dancing were the responsibility of the Twinning Association. In the afternoons they took their guests from the continent to old-established places such as a cheese making factory. "The most surprising thing about England was the good weather." said Yvonne Barton who had brought back quite different memories of her visit from the year before. Overall she sensed a really pleasant ambience in the towns and countryside. Barton praised the attitude of the British people. Obviously, using the new English term 'chillaxing' (in new German 'chillaxen') which the English learners brought back with them, the English seemed to have taken this attitude to heart. Also in the run up to the Olympics the laid-back attitude to this mega-event was noticeable. 'HoTi' man Holger Schneider, with a grounding in primary education and sports teaching, was so interested in seeing top athletes perform that he was motivated to join this year's course. Following the course he and his daughter added on a week in London and met quite by chance one of the actual Olympic winners. What the Bischofsheim Twinning Committee wants, which they haven't yet got, is a wider interest in such an offer apart from the circle who constantly involve themselves in twinning activities. 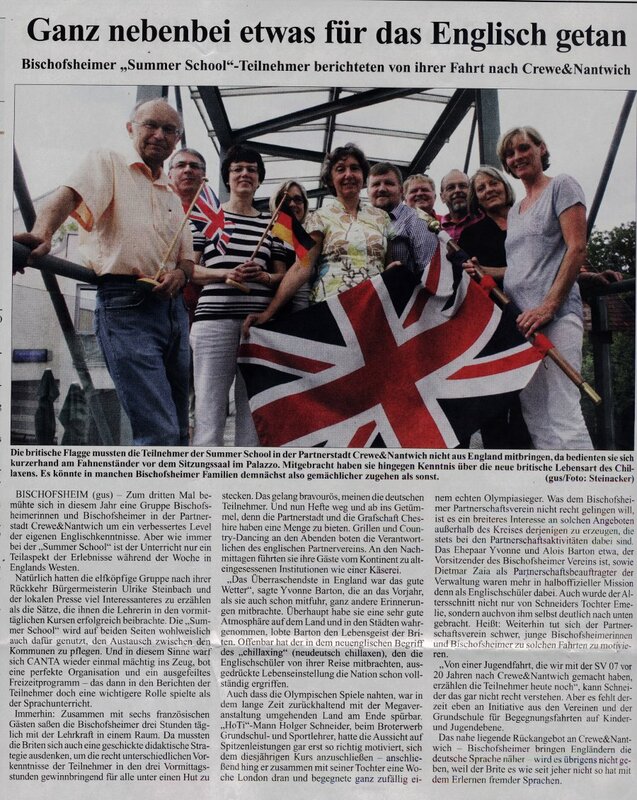 The married coulple Yvonne and Alois Barton for example, the Chairman of the Bischofsheim Association, Dietmar Zaia as the twinning representative of the administration, were there more as official representatives than English learners. Schneider's daughter and he himself clearly brought the average age down. To emphasise the point: the Twinning Committe finds it difficult to motivate younger Bischofsheimers to make such trips. The SV 07 Sports Club has been organising visits for young people for 20 years the participants explained today. Schneider doesn't understand what's been going on. But the Twinning Association does lack, at the moment, an initiative involving trips for young people and children to meet up. by the way, the obvious reciprocal offer to Crewe & Nantwich, Bischofsheim getting English people to speak German better, won't happen because the Brits have never been into learning foreign languages.